Fresh Ginger Molasses Cookies | wanna come with? This is the first recipe I’ve tried from this book, The Dahlia Bakery Cookbook. I’ve never been to the Dahlia Bakery – never heard of it before to be honest – but it’s a really pretty book and has a nice selection of recipes. From cookies to pies to cakes to ice cream, there’s a bit of everything. And based on this cookie, it’s a good addition to my collection. 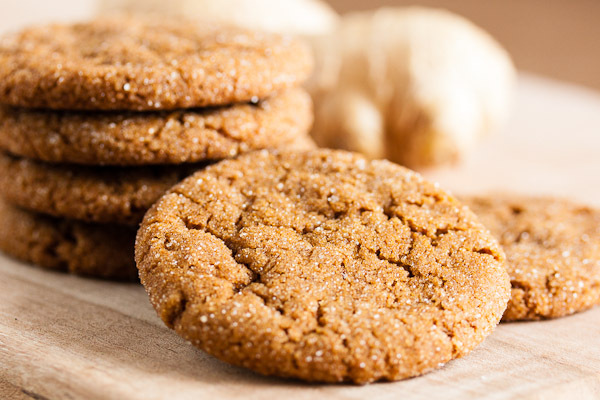 Using fresh grated ginger root adds a bit of heat to an otherwise sweet cookie. Not that there’s anything wrong with a regular ginger cookie, but I like the contrast this adds. And rolling them in sugar before baking adds both another level of sweetness and a lovely sparkle to the finished cookie. These cookies form a beautiful cracked top as they bake. When they came out of the oven, they were nice and crispy (which is my preference). But by the next day they’d lost that crunch and were soft and chewy. Not sure if that’s normal for this cookie or just because it’s so humid in Vancouver. 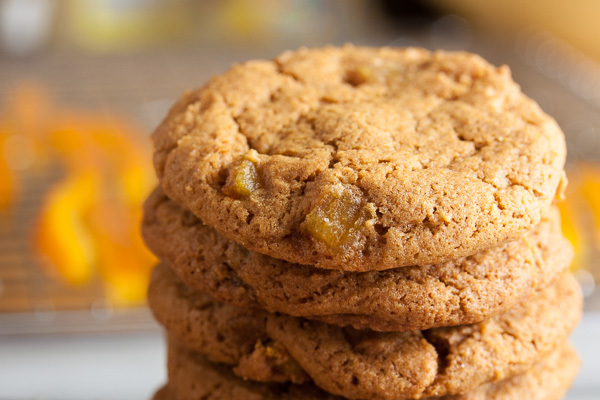 Regardless of texture, the fresh ginger, the cinnamon, and rich molasses combine to create a delicious cookie. If I could, I’d eat them all fresh from the oven (you think I’m joking, don’t you?). Adapted from "Old-Fashioned Molasses Cookies with Fresh Ginger" from The Dahlia Bakery Cookbook by Tom Douglas and Shelley Lance. The recipe states it makes 54 cookies, but I got just shy of 70. In the bowl of a stand mixer fitted with the paddle attachment, beat the butter and sugar together on medium speed until light and fluffy, about 3 or 4 minutes. Scrape down the sides of the bowl and add the egg, ginger and molasses. Continue to beat until blended together. Cover and refrigerate the dough for at least one hour. When ready to bake, preheat the oven to 350°F. Form dough into small balls, about 3/4? diameter. 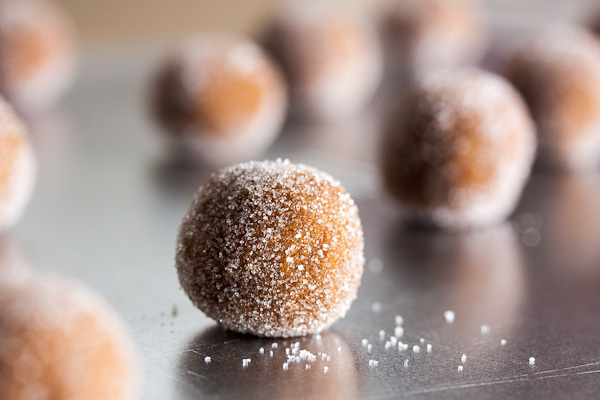 Roll each in sugar and place about 2? 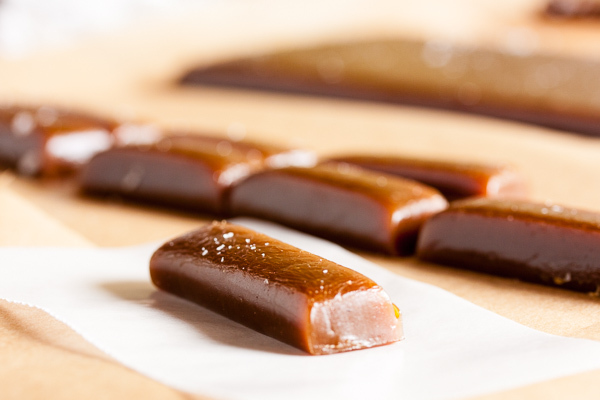 apart on baking sheet to allow for spreading, and press down just slightly with the palm of your hand. I tried a few without pressing them down first, and they spread out perfectly. So you could probably skip this if you want. Bake for about 7-8 minutes, until golden brown around the edges, but still slightly soft in the middle – rotating the baking sheet halfway through. These cookies will puff up and spread during the first few minutes of baking, but then will begin to crack and flatten out. Allow to cool on a wire rack for a few minutes before removing the cookies from the pan and allowing them to cool completely. They'll firm up as they cool. 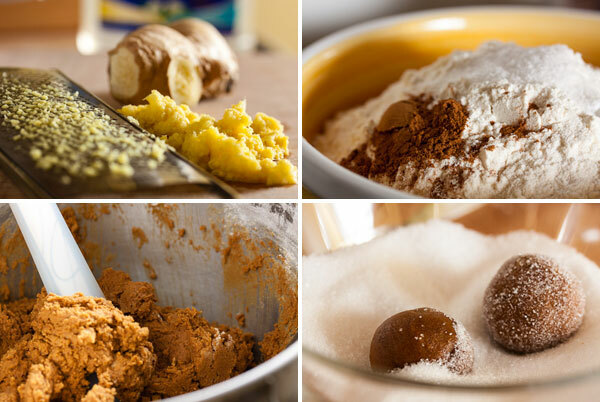 Wow, those are some really great pictures – make me want to grab one of these cookies RIGHT NOW 😀 and the addition of freshly grated ginger sounds awesome – such a simple idea, but somehow I’ve never thought of it… Will keep it in mind for future ginger baking – Thanks! Wow, thank YOU so much! 😀 I have another recipe with fresh grated ginger that I make every xmas. It’s a chocolate cookie with chocolate chunks AND both fresh and ground ginger. So good. I’ll be posting it probably towards the beginning of December! These sound amazing — I am a huge fresh ginger fan. Thanks Tammela! 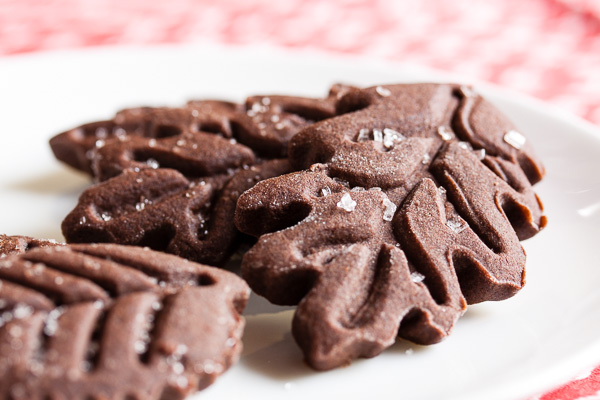 I just made some chocolate ginger cookies this week, also with fresh ginger. I should have the post up by the weekend (hopefully). Thank you so much for this recipe.Cookies are delicious. 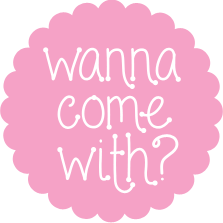 ?Will definitely make them again.Soon!? Made these cookies today and it is a keeper! Using fresh ginger versus ginger powder makes a huge difference. 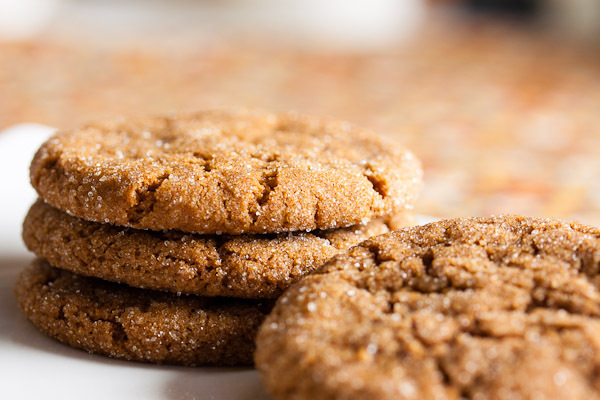 I actually made one batch based on this recipe and another batch based on the flour bakery ginger molasses cookie and this one wins in our house. Thank you very for featuring this cookie. I’m so glad to hear, Mary Ann! 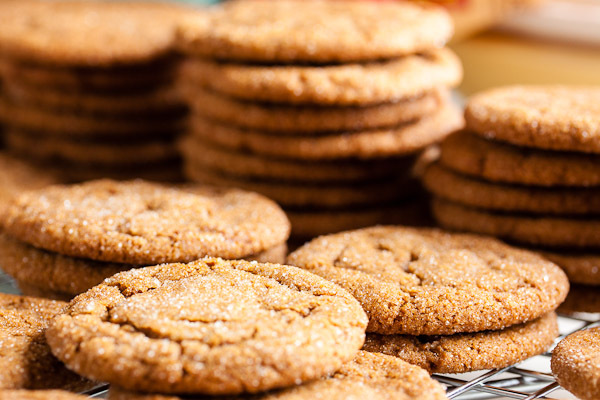 If you like ginger, you should try the Princeton Gingersnaps next. SO GOOD. My dough is in the fridge and I can hardly wait to get these baked for my hubby. The dough tastes incredible! I’ve never used fresh ginger before. What a difference.